Wed., Sept. 20, 2017, 6:36 a.m.
BATON ROUGE, La. – The hurricanes that battered Texas and Florida have likely spawned the worst disaster-created housing crisis since Hurricane Katrina left hundreds of thousands of Gulf Coast residents without homes more than a decade ago. The Federal Emergency Management Agency said it’s not borrowing from its much-maligned Katrina playbook to rely on government-issued trailers or mobile homes to shelter residents displaced by hurricanes Harvey and Irma. After Katrina struck in 2005, federal lawsuits accused FEMA of recklessly providing scores of storm victims with shoddily constructed trailers that exposed occupants to toxic fumes. FEMA, which stopped using the cramped travel trailers, has touted the safety features of its latest generation of mobile homes. Long, however, said manufactured housing will not be the primary way people in Texas and Florida are provided temporary housing in the coming months. Harvey flooded more than 79,000 homes with at least 18 inches of water, according to a FEMA official. More than 740,000 households have registered for FEMA aid, such as rental assistance and money for damage repairs. The agency already is paying for tens of thousands of Harvey victims to stay in hotels and motels in 33 states. Long is working with Texas Gov. Greg Abbott to find ways to get people back in their flood-damaged homes more quickly, without using manufactured housing. “The way we’ve done business in the past has not necessarily been successful. It’s been a frustrating road,” Long said Friday. During a record-setting hurricane season in 2005, Katrina’s devastation sent FEMA scrambling to meet the unprecedented need for temporary housing in Louisiana, Mississippi and Alabama. Less than one month after Katrina’s landfall, Hurricane Rita roared ashore and demolished roughly 23,000 more homes in Texas and Louisiana. 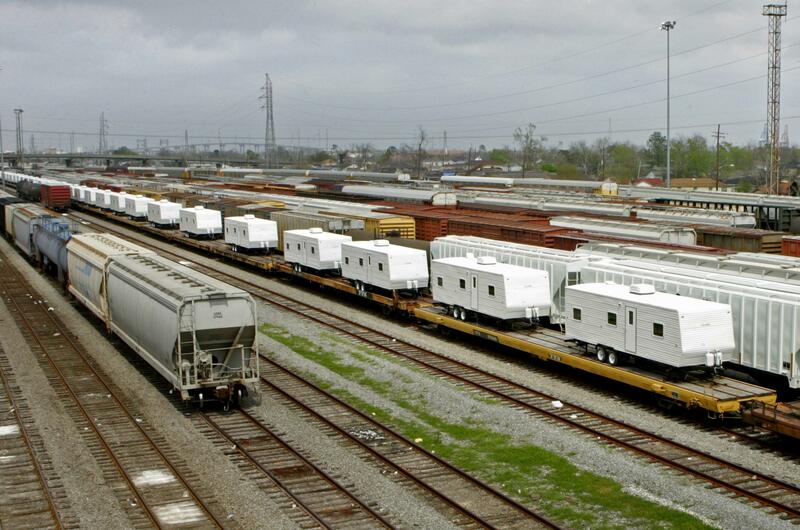 FEMA purchased more than 140,000 new trailers and mobile homes to house Katrina and Rita victims near their storm-shattered properties or in makeshift trailer parks. By March 2006, FEMA learned of concerns that travel trailers were exposing occupants to elevated formaldehyde levels. Formaldehyde, a chemical commonly found in building materials, can cause breathing problems and is classified as a carcinogen. Many trailer occupants began complaining of headaches, nosebleeds and difficulty breathing. Government tests on hundreds of trailers in Louisiana and Mississippi found formaldehyde levels that were, on average, about five times higher than in most modern homes. Storm victims’ attorneys accused the trailer makers of using substandard building materials and methods in a rush to fill FEMA’s orders. The lawyers also claimed FEMA downplayed the formaldehyde concerns for months and initially balked at air quality tests to avoid legal liability. A team of attorneys sued the federal government and travel manufacturers on behalf of tens of thousands of storm victims. But a federal judge dismissed all claims against the federal government, ruling FEMA couldn’t be held liable for deciding to use travel trailers after Katrina and Rita. More than 4,600 households in south Louisiana have lived in FEMA-supplied mobile homes since a storm dumped more than two feet of rain on parts of the region last summer, damaging or destroying tens of thousands of homes. Approximately 3,000 families, mostly in the Baton Rouge area, were still living in the “manufactured housing units” as of Thursday. For nearly nine months, Misty Munsell has shared one of those mobile homes with her 64-year-old mother and 85-year-old grandmother. The family moved in two days before Christmas, after waiting several weeks for FEMA contractors to finish installing it next to the moldy, gutted wreckage of their Baton Rouge house. “It doesn’t feel like home, but we try,” said Munsell, a 34-year-old emergency medical technician who helped rescue neighbors from last August’s floodwaters. Storage space is limited, so their floors are cluttered with garbage bags filled with clean clothes and linens. Thunderstorms rattle their walls and windows. The smoke detector goes off if they cook with stovetop burners on their hottest setting. Raw sewage leaked from an unsealed pipe, and the nauseating smell lasted for days. “It’s better than the alternative of nothing,” said Munsell’s mother, Linda Naquin. State Rep. Ted James, who lives in the same subdivision as Munsell’s family, said he has seen the mobile homes arrive at a nearby staging area and sit unoccupied for weeks. The Democrat blames “federal red tape” for the slow pace. Published: Sept. 20, 2017, 6:36 a.m.